The Skinny: Sammo Hung and Lau Kar Wing play dual roles as both masters and students of the sword and spear styles of kung fu. Comic mayhem ensues when the students get kidnapped and the masters must rescue them. 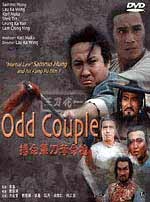 Magicvoice: Lau Kar wing is the master of spears and Sammo Hung is the master of swords. Each year they meet and have a friendly duel, which usually ends in a draw because both are equally skilled in their methods. Their solution to his stalemate is to each train an apprentice and then have them do battle to see whose style is superior. Referencing the title, Lau Kar Wing plays the young student of Hung and Hung plays the student of Lau Kar Wing. After ten years, they finally attempt to stage the fight between the prodigies. However, their plans are spoiled by a vengeful enemy of Hung, who shows up out of nowhere and kidnaps the two students. The masters must then put aside their competitive relationship and embark on a rescue mission to save the younger men. If Odd Couple sounds silly and fun, that's because it is. Sammo Hung and Lau Kar Wing look like they're having a blast with their dual roles. There's also wall-to-wall sword and spear fighting, which is sure to entertain even the most jaded viewer. Sure, there are several extraneous scenes involving annoying supporting characters who have nothing to add to the story. However, they're simply catalysts to more great fights. Fighting is what this movie is really about anyway, so it really doesn't matter that the script is bad. There's enough talent behind this film to pull it through the bad parts. It's kind of like eating pizza; some pizza is better than others, but even the ones that aren't so great are satisfying in their own way.